Here’s another one from the Docklands in Dublin. Even though Dublin at this point probably has the most heated housing market on the planet (an apartment in Manhattan comes cheaper, townhouses seem to be close) and despite the fact that I have seen people running around with *two* Blackberries, customs still appear to be kind of rural. That’s not a cheap shot with regards to sexual preference. I have seen business people wearing elegant dark suits with thick, white woolen socks. It feels like the whole internet-era is just a game, and soon we’ll all return to reality, that is, the farm, the sheep, the meadows. The one thing that the Irish don’t seem to be willing to give up, even for the game of dressing up in three piece pinstriped suits and making tons of money, are their very dear cigarettes. What then is the plural of “sheep”? 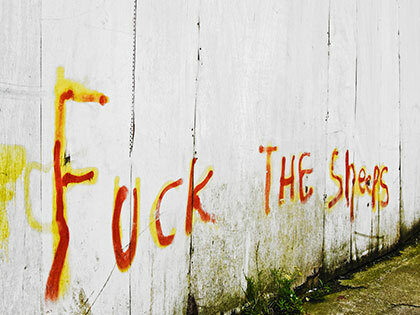 “Sheeps”? I mean, of all people, one should trust the Irish on this one. Previous PostPrevious No Coffee To Go: My Stay With The Lotus Eaters, By Mara L.